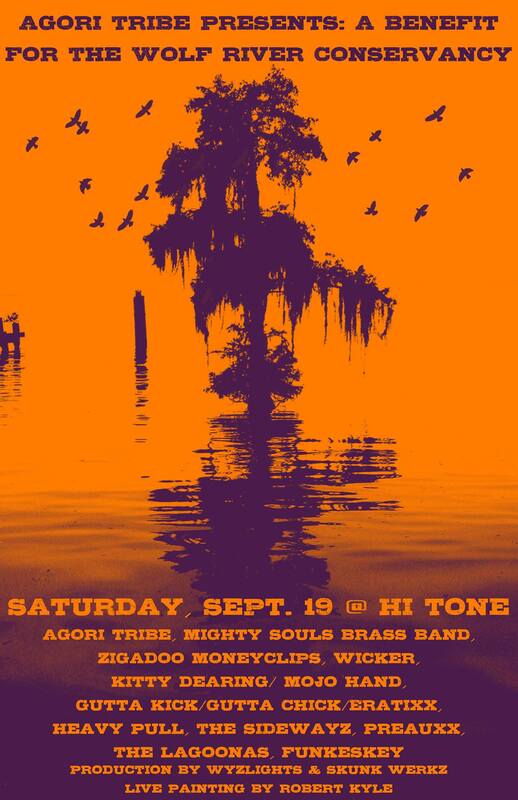 Agori Tribe and Ragin’ Randy Entertainment have put together an incredible benefit concert for the Wolf River Conservancy at the Hi-Tone Cafe! We’re less than two weeks out folks, and we need everyone to come out and support this wonderful cause! The Wolf River Conservancy does great work for the city of Memphis, keeping the historic Wolf River healthy and clean, as well as other noble projects such as the Wolf River Greenway Trail. Join us HERE Saturday, September 19 for a night of incredible Memphis Music, live artwork, community and celebration, while contributing to a great cause to further our great city. You can expect amazing performances, with genres ranging from rock & roll to folk to hip hop to electronic, from the likes of Wicker, The Lagoonas, Zigadoo Moneyclips, The Sidewayz, Preauxx, Gutta Kick, Gutta Chick, Eratixx, and a headlining set from The Mighty Souls Brass Band! All of this for just a minimum donation of $5.00, and of course, a late night closing set from Agori Tribe. We will also feature live painting from local artist Robert Kyle. His resulting work will be auctioned to further benefit the Wolf River Conservancy. We are also please to announce that we will feature live production from WyzLytes (small room) and Skunk Werkz Productions (big room) to provide a phenomenal live music experience for all of you! See the full lineup below. Hope to see you out there! This entry was posted in Agori Tribe and tagged Agori Tribe, Benefit Concert, Community, Concert, Eratixx, Gutta Chick, Gutta Kick, Hi-Tone, Hi-Tone Cafe, Live Art, Live Music, Memphis, Memphis Music, Preauxx, Ragin' Randy Entertainment, The Lagoonas, The Mighty Souls Brass Band, The Sidewayz, Wicker, Wolf River, Wolf River Conservancy, Zigadoo Moneyclips.